With the playoff race coming down to the wire and the battle for top seeding in each conference raging on, the most anticipated game on last night’s schedule may have been the one between the two worst teams in the league. The Coyotes and Sabres met in a rematch of last week’s showdown, one that ended with Sabres fans cheering an overtime goal against their own team. All of that is ridiculous, and it’s a situation the NHL had to know was coming. By going with a draft lottery system that guarantees the last-place team a top-two pick in a draft with two franchise players, the league all but guaranteed that things would get silly as we came down to the wire. The Sabres have been widely accused of tanking their entire season to ensure they get one of those two picks, and the Coyotes have given them a run for their money by trading away just about everyone with a pulse as the season wore on. Meanwhile, fans of other miserable teams like the Oilers and Maple Leafs watch with envy, wishing their teams could drop into the race for dead last. The whole thing is a mess, and the league should be embarrassed. But while it’s easy enough to second-guess the NHL’s handling of the situation, I’m going to invoke my long-standing rule of hockey criticism: You don’t get to complain unless you can offer up a better idea. Luckily, when it comes to assigning draft order, there are plenty of other options available to the league. Some of those involve tweaks to the current way of doing things, others offer more radical changes, and still others discard the existing system entirely and come at the problem from a whole new angle. You won’t like every idea below, but you’ll probably think at least a few of them would be improvements over what we’re stuck with now. So here are a dozen ways the NHL could go about the business of handing out draft picks, ranked in order from the least to most disruptive. We’ll start with the status quo. As a reminder, here’s how the system works today: All 14 teams that miss the playoffs are entered into a lottery, with the worst team getting the best shot at winning (20 percent) and the odds dropping from there. Whichever team wins moves up to the first overall pick, with everyone else slotted in based on the reverse of the final standings (meaning nobody can drop more than one spot). And maybe that’s fine. After all, not everyone thinks the current system is a disaster. And even those who’d agree that this year’s silliness is a bad look for the league might argue that that’s mainly a result of a fairly unique set of circumstances — i.e., two blue-chip franchise players in the same draft. That’s a reasonably rare situation — the last time we’ve seen this sort of top two was probably back in 2004, when Alexander Ovechkin and Evgeni Malkin came in — so maybe there’s no need to panic over a problem that won’t be anywhere near as pronounced most seasons. Biggest advantage: It would certainly be the easiest solution. Biggest objection: The league has already decided against this approach, as we’ll see in the next section. What if we kept the same general idea behind the current system — a weighted lottery involving all the non-playoff teams, with the same set of odds tilted in favor of those that finished further down in the standings — but drew more than one winning number? Like, purely for the sake of argument, three? That would mean you’d have three lottery winners, and they’d get the first three picks in the draft. Other teams could drop as many as three spots, so the team that finished in last place overall could end up picking as far down as fourth. A system like that wouldn’t eliminate tanking, and it wouldn’t discourage fans from rooting against their own team to get better odds. But it would at least reduce the incentive to mount an all-out campaign to finish dead last, and it would prevent a situation like this year, when the reward for being terrible is a guaranteed chance to draft a franchise player. Biggest advantage: The NHL has already decided to do it. The system I just described was approved last summer, and will go into effect next season. Biggest objection: Other than not going far enough, the biggest problem with the league’s new system is that the NHL didn’t implement it for this season. That was understandable — you could argue that it’s unfair to shift the odds around on short notice — but in hindsight, the league should have pushed to get the change done before the offseason started. Don’t like it, bad teams? Make some moves and don’t finish dead last. This is a relatively new idea; I saw it for the first time a few weeks ago in a post on a Coyotes blog. Essentially, you’d keep the existing system, but establish a minimum points threshold that teams would have to hit to be eligible for the draft lottery. Maybe it’s a firm number, or maybe it shifts based on how the league as a whole is performing, but the core idea remains the same: If a team can’t meet that minimum threshold of on-ice respectability, then it loses its eligibility for the lottery. Biggest advantage: Teams couldn’t blatantly tank if they knew they had to maintain some minimal degree of competitiveness. And you’d occasionally get late-season situations in which bad teams had to win their way into the lottery, which would be fun to watch. Biggest objection: We’d probably spend the entire offseason arguing over what exactly the cutoff should be. And while we all hate tankers, sometimes a team finishes last because it really did get hit by a massive wave of bad luck; those teams could end up missing the cutoff even though they weren’t trying to tank. This weekend marked a big milestone in the NHL season, one that fans look forward to every year: the day the X starts showing up on the league’s standings page. That would be the X that signifies that a team has mathematically clinched a playoff spot. It showed up for the first time on Sunday, next to the Canadiens, Rangers, Ducks, and Predators. The Blues and Lightning will get theirs as early as today, and by this time next week, we should have at least half of the 16 playoff teams locked in. After the X comes the Y, denoting teams that have clinched their division. The Ducks will get one soon, having run away with the surprisingly lackluster Pacific, and the Rangers have started to pull away on the rest of the Metro. The Atlantic and Central are different stories, and we may not see those clinched until the final weekend. We’ll also have to wait on the Z (top seed in the conference) and the P (for the Presidents’ Trophy — more on that one down below). But in any case, that nice, clean standings page you’ve been looking at all season is gone now, replaced by the annual descent into alphabet soup. And that’s a good thing, because it means the end of the regular season is in sight. And pretty soon, we can ditch the standings altogether and bring on the playoff brackets. 5. Anaheim Ducks (49-22-7, plus-8 goals differential) With the Pacific almost clinched, now may be the time to rest up for the postseason. The Ducks have a league-low four games left, and all of those are against non-playoff teams. 4. Montreal Canadiens (47-21-8, plus-28) They’ve cooled off slightly, failing to pick up a regulation win in their last three, and host the Lightning tonight in a game that could determine the top seed in the Atlantic. It’s a busy night on the NHL schedule, one of just 17 left in the regular season. With tight playoff races in both conferences and first place in three of the four divisions still up for grabs, there’s going to be compelling action just about every night the rest of the way. For some of you, that’s great — you can pretty much get comfortable on the couch now and settle in for the next few weeks. But if work, family, or other commitments mean you need to be a little more selective in your hockey viewing, now is the time to plan ahead. And because I’m here to help, I went through every night of the remaining schedule to figure out which games will be must-see TV and which ones you can go ahead and skip. Get out your calendars and a highlighter or two, because here we go. The can’t-miss matchup: Coyotes at Sabres — It says something about this tank-fest of a season that this is the night’s most intriguing matchup, and that something probably isn’t good, but here we are. The Sabres and Coyotes are going down to the wire for 30th place, and they play twice in the next five nights. Will either team try? Will they both start their backup goalies? Will any Sabre who scores a goal be immediately beaten over the head with a shovel by Tim Murray? I honestly can’t wait. Other good options: Ducks at Bruins and Rangers at Senators (the two teams fighting for the East’s final wild-card spot both host Presidents’ Trophy candidates); Predators at Lightning (a game that would have passed for a Stanley Cup preview six weeks ago, and might still be); Sharks at Wings (what may be a showdown between the two best available coaches this offseason); Kings at Islanders (L.A.’s tough road trip continues); Canadiens at Jets (yet another Presidents’ Trophy candidate trying to squash a wild-card hopeful). No thanks: Panthers at Maple Leafs — Is Rob Tallas suiting up again? No? Pass. Entertainment quotient: 8/10 — Lots going on tonight. We’re off to a good start. The can’t-miss matchup: Flames at Wild — Two teams scrambling for the West’s final playoff spots meet, and fans of the teams chasing them know what that means: guaranteed three-point game night! Other good options: Blue Jackets at Blackhawks (I know, I know, but at least one is a playoff team). No thanks: Stars at Oilers — Two non-playoff teams makes this one meaningless, although the potential for a 9-8 final is vaguely intriguing. Entertainment quotient: 2/10 — Welp. They can’t all be winners. The can’t-miss matchup: Kings at Wild — The defending champs are on shaky ground to get back into the playoffs, and they’ll face one of the wild-card teams they’re chasing during a brutal five-game road trip. Other good options: Rangers at Bruins (an Original Six matchup between teams headed in opposite directions); Lightning at Red Wings (a possible first-round preview of a series we’d all agree to call the Steve Yzerman Cup); Ducks at Islanders (two very good teams that usually play entertaining games); Predators at Capitals (in which Washington fans spend the whole game wishing they could someday draft a rookie as good as Filip Forsberg). No thanks: Devils at Hurricanes — Two teams that are bad, but not bad enough to be in contention for 30th. By the way, fair warning: Both teams are going to show up a lot in this section. Entertainment quotient: 8/10 — Lots of games, some of them excellent, most of them decent. What else were you going to do on a Saturday night? The can’t-miss matchup: Panthers at Senators — I know, I’m as surprised as you are. But these teams are chasing the East’s final wild-card spot, and there’s only room for one. This is probably as close to a must-win as you can get in March, especially for the Panthers. Other good options: Red Wings at Islanders (two solid Eastern playoff teams); Blackhawks at Jets (a sneaky important Central matchup); Capitals at Rangers (looking more and more like a first-round preview); Flames at Predators (facing off for the “teams I was most inexcusably wrong about” championship). No thanks: Ducks at Devils — It’s the awesome team with shaky goaltending versus the shaky team with awesome goaltending. Spoiler alert: The Ducks win a one-goal game. Entertainment quotient: 7/10 — With eight games, there isn’t a busier Sunday this season. Stop me if you’ve heard this one before: There’s an NHL hockey team that’s not all that good according to the numbers, yet somehow keeps winning. The stats guys say that it can’t possibly continue, that we’ve seen this movie before, and that history tells us the ending won’t be happy. But others aren’t so sure, wondering if maybe, just maybe, this is the team that’s figured out a way to beat the system. Unless you’re brand new to hockey, you have indeed heard this one before, and you’ve heard it more than once. Four years ago, it was the Dallas Stars. The year after that, it was the Minnesota Wild. Last year we had two teams, the Colorado Avalanche and the Toronto Maple Leafs, offering different interpretations of the same role. All of them seemed to be defying the numbers. All of them eventually crashed back down to earth. This year’s overachiever is the Calgary Flames. Heading into the season, they weren’t expected to be very good. And 73 games in, they haven’t been — at least according to many of today’s most-used stats, which rely on proxies for puck possession to determine which teams are most likely to experience sustained success. The more you have the puck, the more you should win. It doesn’t always work out that way in the short term, as factors like goaltending, special teams, and just plain luck can get in the way. But wait long enough, and your possession numbers catch up to you. They always do. We’ve been down this road before. We know what’s coming. We’ve seen it all before, over and over again, for years. So why do this year’s Flames seem like they’re different? Let’s start with the numbers. By now you’re sick to death of hearing about hockey’s new wave of advanced stats, most of which aren’t especially advanced at all. 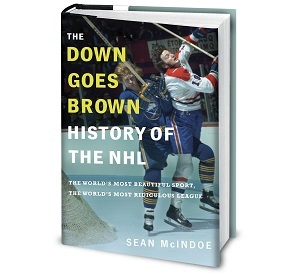 The new thinking has redefined hockey analysis, invaded NHL front offices, and started showing up in even the oldest of old-school media coverage. At a basic level, those numbers tend to focus on possession rates, a relatively new approach that turns out to tell us plenty about a hockey team. And what it seems to tell us is this: A team’s possession numbers are just about the single best predictor we have of future success. If you woke up from a coma three-quarters into an NHL season and were forced at gunpoint to pick the teams with the best chance at winning the Stanley Cup using only one stat, you’d want a look at the possession numbers. Ideally, you’d want those numbers to be for even strength and in close situations only, or even better, score-adjusted. Those are important distinctions, but to keep things simple, we’re just going to lump everything together as “possession” today. Possession numbers typically predict the future better than anything else — better than goals scored or allowed, better than shooting or save percentages, better even than wins and losses. A big part of that is that possession numbers tend to be much more consistent than other stats, which rely on smaller sample sizes and can fluctuate wildly from game to game and from week to week. So possession tends to equal wins. Which you’d expect, when you think about it — a hockey team that can maintain a 55 percent–45 percent edge in possession is like a baseball team that gets 11 innings at bat while the other team gets the usual nine. That’s an enormous advantage, and while it wouldn’t translate into a guaranteed win every night, over the course of a long season you’d expect it to add up. And in most cases, it does. For example, if you’re the sort of fan who looks at possession numbers, you weren’t remotely surprised when the Kings won the Stanley Cup as an 8-seed in 2012, and you barely blinked when they did it again as a 6-seed last year. And you knew that the Stars, Wild, Avalanche, and Leafs were all headed for a fall, even as their fans insisted they were for real. A basic understanding of possession stats is the great spoiler alert of hockey fandom. All of which brings us to this year’s Flames, one of the worst possession teams in the league. They sit 28th in score-adjusted Corsi, and the only other team in the bottom third that’s even close to a playoff spot is doing it on the back of a goalie who’s probably going to win MVP. And it’s not just the fancy stats that point to the Flames being a bad team. On paper, they don’t have a ton of talent, and their best player and captain, defenseman Mark Giordano, was lost for the season last month. And yet, numbers be damned, Calgary just keeps winning. A team that everyone expected to contend for last place overall is instead right in the thick of the playoff race in a very tough Western Conference. After one month, it was a cute early-season plotline. After two, it was getting into Cinderella territory, a fun little story that nobody really took seriously. You couldn’t even say the Flames were counted out, because that would imply that anyone had ever counted them in. Last week, ESPN’s Craig Custance wrote an article that asked a fun hypothetical question: How much would it cost to trade up to the no. 1 pick in this year’s draft? The short answer: a ton. In fact, probably so much that a deal would be all-but-impossible to pull off. After all, this isn’t just any draft — this is the Connor McDavid draft, the one in which the team that holds the first pick will end up drafting a sure-thing franchise player who’s been compared to Sidney Crosby. But midway through the article came a fascinating reveal: Sabres GM Tim Murray has already spent some time thinking about the question. And he thinks he might be able to get it done. And the more I think about it, the more I suspect he’s right. Let’s assume that the Sabres do finish last — sorry, Coyotes fans — but then lose the lottery. They’d still have the second overall pick. That’s Jack Eichel’s spot, and most scouts consider him almost-but-not-quite in McDavid’s ballpark. Could Murray use that second overall pick, plus a package of other picks and prospects — of which the Sabres have an impressive stockpile — to convince the lucky lottery winner to trade down one spot? Remember, the Sabres have been pretty blatant about making their whole season about McDavid, even taking the unusual step of hosting his junior team for a game. They did all of that knowing the best odds they could get in the lottery were just 20 percent. Yet they seemed awfully confident. Could that be because Murray has had a plan B all along? Could Murray pull it off? Let’s see if there’s anything he can learn from the GMs who’ve pulled the trigger. The trade: The California Golden Seals trade their 1971 first-rounder (no. 1) and Francois Lacombe to the Canadiens for their 1970 first-rounder (no. 10) and Ernie Hicke. The background: This was in the early days of the NHL draft, before anyone had really figured out what to do and the whole thing made absolutely no sense. Montreal GM Sam Pollock took advantage of that confusion to continually fleece other teams out of first-rounders, which is what happened here; this trade actually went down more than a year before the 1971 draft. Pollock knew there was a potential franchise player in Lafleur available in 1971, while the Golden Seals … well, the Golden Seals didn’t know what they were doing. The trade: The Flyers trade Bill Clement, Don McLean and the no. 18 pick to the Capitals for the no. 1 selection. The background: That package doesn’t sound like much to give up for the first overall pick, and that sort of offer this year would probably get you laughed out of the room. But the 1975 draft was awful, ranking among the weakest ever. It didn’t produce a single Hall of Famer, and only one player went on to score 1,000 career points — and that guy, Dave Taylor, was taken in the 15th round. Bridgman was a decent player, the best taken in the first round, but that’s about it. The lesson for Murray: Drive the price down by convincing everyone this is a terrible draft. Look, Tim, we never said this was going to be easy. With just under three weeks left in the regular season, most of the attention is focused on the standings and the handful of teams fighting for an even smaller handful of remaining playoff spots. But there’s another tight race worth paying attention to, one that could end up being as close as we’ve ever seen. It’s the race for the Art Ross Trophy, awarded to the league’s top scorer, and right now it’s wide open. Injuries to onetime leaders Patrick Kane and Tyler Seguin and an extended quasi-slump on Sidney Crosby’s part have resulted in a logjam at the top of the scoring table, with five players within two points of the lead and 17 within 10. That’s unprecedented, and has made it just about impossible to pick out a favorite. Crosby and teammate Evgeni Malkin have the best point-per-game averages, so maybe you give them the edge if they’re healthy. Alexander Ovechkin has been the hottest player since the new year, so maybe he’s your best bet. But unlike those three players, John Tavares and Nicklas Backstrom have never won the award, so maybe it’s their time. Or maybe it’s all just a guessing game. In addition to being so close, this year’s Art Ross race is also remarkable for how low the scoring totals are. Only four players have won the Art Ross with fewer than 100 points during the almost 50 years of the post-expansion era, but a new name will join that group this year. As of this morning, Crosby is leading with 74 points. That puts him on pace for 85 points, which would be the lowest total for an Art Ross winner in the modern era. Normally, an Art Ross update would serve as a de facto Hart Trophy update as well, since the league’s leading scorer is usually also named MVP. But more and more, this year’s Hart is looking like Carey Price’s to lose. That’s partly because of his dominant play in goal for the Canadiens, and partly because of the lackluster scoring totals put up by the guys in the Art Ross race. Unless one of the offensive guys can catch fire over the last few weeks, it looks like we’ll have our first goalie MVP since 2002. 5. Chicago Blackhawks (43-22-6, plus-35) Oh, good, look who’s heating up just in time for the playoffs. 4. Anaheim Ducks (46-21-7, plus-7) The race to be the first team to 100 points probably ends tomorrow. The Ducks are in Columbus, so you have to like their odds. Ottawa Senators goaltender Andrew Hammond has become one of the season’s best stories. The 27-year-old rookie has come out of nowhere to post one of the best starts to an NHL career we’ve ever seen. After last night’s 2-1 overtime win over the Hurricanes, Hammond now boasts a career record of 11-0-1, and has tied Frank Brimsek’s record by starting his career with 12 straight games allowing two goals or fewer. Now that Hammond has started writing his name in the record book, he’s in some elite company. When it comes to goaltending records, most fans know the basics. It’s Martin Brodeur for regular-season wins and shutouts. Patrick Roy for playoff wins. And, of course, Glenn Hall’s 502 consecutive games, which stands as probably the most unbreakable record in all of pro sports. Those records are fun, but as regular readers know, I like to go a little more obscure. So today, in honor of Hammond’s miracle run, let’s take a look at 10 of the more unusual goaltending marks in the NHL record book. This is one of the records that Hammond is chasing, kind of, or maybe not, since in today’s NHL an overtime or shootout loss only sort of counts. But in any event, Senators fans hoping that they’ve somehow stumbled on the next Ken Dryden probably won’t be thrilled to be reminded of the man who once started his career by going 16 games without losing: Patrick Lalime. Lalime set the record with the Penguins in 1997, topping the 14-game mark held by Dryden and Ross Brooks. He cooled off, but still ended the season with an impressive 21-12-2 record, and finished fifth in rookie of the year voting. Oddly enough, that would be the end of his time in Pittsburgh, and his NHL action at all for more than two years. He finally returned to the league in 1999 as a member of the Senators. It was during his time in Ottawa that Lalime established a reputation as a solid regular-season goalie who couldn’t win the big game in the playoffs. We’ve covered this before, but it’s worth repeating here: that reputation is nonsense, because Lalime had excellent playoff numbers. But a handful of bad games, including one memorable Game 7 meltdown against the Maple Leafs, sealed his fate. Lalime ended up playing for five teams over 12 seasons, earning an even 200 regular-season wins. Andrew Hammond would probably be thrilled with that sort of career, even if it’s not quite Drydenesque. In any event, Hammond can at least know that Lalime is rooting for him. Goalies occasionally get mixed up in physical play, and every now and then they’ll even drop the gloves and square off. But only one goaltender in NHL history has ever cracked the 100-plus PIM mark, and you’ll never guess who it was. Wait, did literally everyone just guess Ron Hextall? OK, in that case everyone is right. Hextall topped the century mark for three straight years in the late ’80s, peaking with 113 PIMs in 1988-89. Those seasons give Hextall the top three spots on the all-time list, and while he calmed down in later years, his name still appears three more times in the top 25. More impressively, his 1988-89 total doesn’t even include his most famous meltdown from that season, since that occurred during the playoffs. The record for most PIMs in a season by a goalie who wasn’t Ron Hextall is 70 minutes, and the owner of that mark actually is a bit of a surprise. It’s not a noted crease defender like Billy Smith or Eddie Belfour, or a slugger like Sean Burke, Ray Emery, or even Patrick Roy. No, the non-Hextall title goes to Tom Barrasso, who set the mark during a 1988-89 split between those oddball Buffalo Sabres and the Penguins. If you’re a regular reader of this site’s NHL coverage, you’ve watched us spend the better part of a year trying to figure out the San Jose Sharks. When everyone was blaming Joe Thornton for last year’s crushing playoff loss, we defended him. When they seemed to promise to hit the reset button over the offseason and then didn’t, we were puzzled. When they vowed to be better, we wanted to believe. When they took it outside against the Kings, and lost, we were there. And then we basically gave up trying to make any sense of it all, because this seemed like a team waiting for a wrecking ball that didn’t want to arrive. And with that, it would appear, we can probably move this whole mess from the “awkward” pile on over to “completely unfixable.” Clearly, this blowup has been coming all season long, and the inevitable attempts to patch it over will now ring hollow. The Sharks, at least off the ice, appear to be officially broken. On the ice, all of this is going on right as the Sharks head into the homestretch very much in playoff contention. They’re four back of the Jets for the West’s final wild-card spot, and had an opportunity to close that gap in Saturday’s matchup against the Hawks. Instead, they gave up four third-period goals on their way to dropping a 6-2 decision. They face the Jets tomorrow night in a crucial game that also serves as the opener to a tough seven-game road trip. Maybe Thornton’s mini meltdown emerges as the rallying cry for a team that has seemed to be drifting along all season without any real direction. Or maybe it’s just the spark that finally lights the wick for this team to be blown up once and for all in the offseason. We won’t be able to fill in the proper narrative until the Sharks’ season ends. In the meantime, we should all probably shut our mouths, just in case we accidentally imply that Joe Thornton sometimes lashes out. 5. Montreal Canadiens (43-19-7, plus-29) They’ve lost five of seven this month, and would surrender first place in the Atlantic with a regulation loss to the Lightning tonight. 4. Anaheim Ducks (44-20-7, plus-13) Still a tough team to figure out. They’re two points out of first overall, despite owning a worse goals differential than the 18th-place Senators. Today is trade deadline day, with a 3 p.m. ET cutoff for teams looking to make a deal. And after a very busy weekend, there may not be much excitement left. We ran a full preview on Thursday. Here’s a quick roundup of the deals we’ve seen since then. The Rangers went all-in: New York landed arguably the biggest name available, acquiring Arizona’s Keith Yandle in a blockbuster. But the Rangers paid a big price, giving up an excellent prospect in Anthony Duclair and next year’s first-rounder. The Coyotes retain half of Yandle’s salary, which makes him an excellent value, and he’s signed through next year, so this isn’t a straight rental. But it feels like an all-or-nothing gamble for New York, and maybe that makes sense for a team that was just a few bounces away from a championship last year. The Rangers also acquired James Sheppard from San Jose, sent Lee Stempniak to Winnipeg, and have reportedly agreed on a new deal with Mats Zuccarello. The Blackhawks loaded up: Chicago added two of the top players available, in Antoine Vermette and Kimmo Timonen. Vermette is a solid two-way player who won’t replace the injured Patrick Kane, but will play strong middle-six minutes. Timonen hadn’t played a game for the Flyers this season due to blood clots, but is reportedly healthy now, and if he can play at the same level he was at last year, he could be the deadline’s best acquisition. He’s a gamble, sure, but a high-reward one that certainly looks good from the Hawks’ side. The Lightning made their moves: Steve Yzerman stayed up late last night, pulling off a pair of deals. He sent Brett Connolly to Boston for two seconds, and then flipped a first, third, and Radko Gudas to Philadelphia for Braydon Coburn. That’s a pretty clear net gain for the Lightning, who remain one of the co-favorites in a hard-to-call East. The Maple Leafs traded David Clarkson: Hours after I wrote that it was impossible, the Leafs found a way to trade the league’s worst contract on Thursday. And somehow, it made perfect sense. The Blue Jackets had Nathan Horton’s contract clogging their books; Horton isn’t expect to ever play again due to back problems, but his deal was uninsured, so the Jackets were on the hook for every dollar of it. So they swapped him for Clarkson, a player who’ll actually suit up for roughly the same money. And the Leafs get eventual salary-cap relief thanks to the LTIR. It’s brilliant. The Panthers (?) got Jaromir Jagr: We expected Jagr to be moved, although the idea was that he’d go to a contender and the Panthers sure don’t seem like one. But Jagr winding up in Florida, even at the cost of a pair of decent picks, could put the Panthers over the top in the chase for the East’s final wild-card spot. Washington added Curtis Glencross: The Flames forward was expected to be on the move, and he didn’t come cheap, with the Caps giving up a second and a third in this year’s draft. With Washington all but locked into a playoff spot, the team is thinking postseason depth here. The Red Wings landed Erik Cole: Having lost six straight to fall out of the race, Dallas sent the veteran forward to Detroit for a pick and a pair of decent prospects. The Wings still need blue-line help and may not be done. The Habs added Jeff Petry: There may not have been a more divisive player available; the old school doesn’t like his game much, but analytics types love him. The Habs got him for a second and a fifth. The Maple Leafs traded David Clarkson: I know I mentioned that already. I just really enjoy typing those words. I promise it won’t happen again. The Ducks added Tomas Fleischmann: The Ducks get a useful player. The Panthers get a draft pick. The rest of us get to say, “Wait, Dany Heatley is still playing?” I’d call that a win all the way around. A few other smaller deals: Tim Gleason! Spencer Abbott! Adam Cracknell! Carl Klingberg! You are vaguely aware of who some of these people are! The Maple Leafs traded David Clarkson: I lied. So with all of those deals done, what’s still left on the table for today? Well … not much, to be honest. But here are a few names to watch. Most of Toronto’s roster: It sounds like the odds of a Phil Kessel deal are close to zero, while a Dion Phaneuf move is unlikely but still in play; action around both players could pick up near the draft instead. Joffrey Lupul, Tyler Bozak, and maybe even Jonathan Bernier are in play, although it’s possible that nobody of any significance gets moved. Patrick Sharp: Well, this one was fun while it lasted, at least. First the Blackhawks star was on the block. Then he wasn’t. Then he was threatening legal action. So, nothing to see here, apparently. Zbynek Michalek: Oh, right, the other Coyotes defenseman. He’ll probably go somewhere, and the way Arizona GM Don Maloney is going, it will be in exchange for a lot more than you’d think. The Maple Leafs traded David Clarkson: I may need help. 5. Detroit Red Wings (35-15-11, plus-21) The top of the East remains a pick’em, but an impressive road win over Nashville earns the Wings a temporary spot. 4. Anaheim Ducks (40-17-7, plus-12) This Corey Perry goal is so filthy. You really need to stick around for the last slow-motion replay to appreciate it.